Greek Orthodox Easter, that is. Our trip to Greece this spring was timed to fall over the Orthodox Easter, which usually falls a week after Protestant and Catholic Easter, since it's on a different calendar. 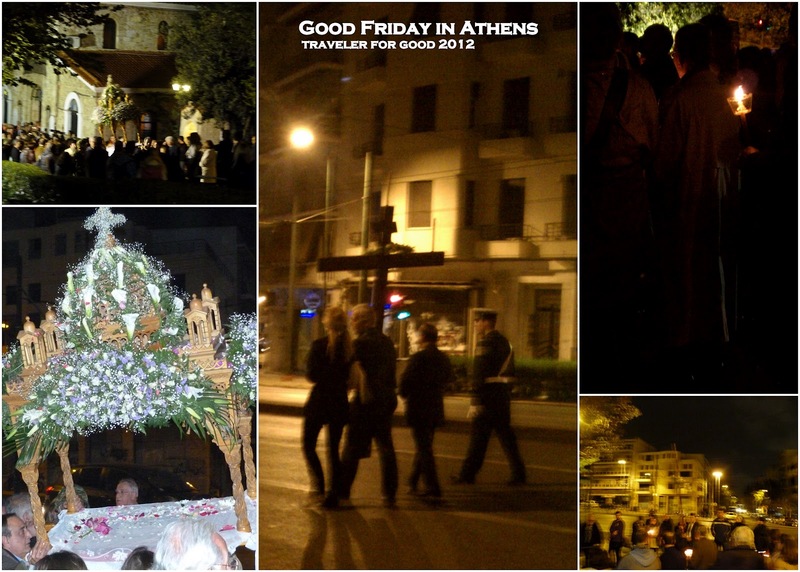 We returned to Athens on Good Friday after our classical tour. In the market all sorts of vendors were selling candles, simple or heavily decorated, and by 6:30 everyone was hurrying towards their respective churches and shops were starting to close down. There is a Good Friday service - the small church down the street from our hotel was filled to capacity with people and the overflow went all the way out the street. When the service is over there is a procession through the neighborhood. Members of the church carry the cross and the epitaph. The epitaph (Bier of Christ) is decorated with flowers by the congregation and is carried through the streets. The congregation and community follows the cross, epitaph and the priests through the neighborhood. I enjoyed participating in the procession along with the community. We stopped twice when the priests would say a blessing maybe sing - once by the Temple of Zeus and again in front of our hotel (the hotel provides financial support to the church). What an amazing experience to celebrate! What is the most memorable religious holiday, festival, or event that you've partaken in while traveling?